Most days we eat eggs, bread, butter, jam or similar foods for breakfast because who’s got the time for a fancy breakfast anyway. While running late from work or school, we quickly grab a boring old sandwich to get by. 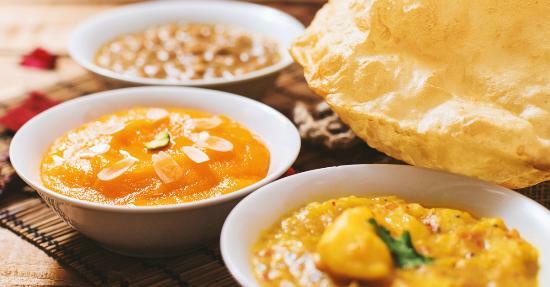 But then there are times when we have had enough of these and we start craving proper desi nashta like a hearty puri with a deliciously hot plate of halwa and chanay. But the thing is, we don’t want just any halwa puri. We want the best halwa puri that Lahore has to offer. But, does this & best halwa puri’ even exist, you ask. Well, let us tell you a story. Fifty years ago, a hardworking man wanted to create the best halwa puri. So he worked day and night to create the perfect desi nashta. His continuous struggle towards learning and crafting the perfect recipe for halwa puri led him to become the maestro that he is today. That man is behind the much venerated halwa puri place known as Taj Mahal Sweets. Located near Badshahi mosque in Lahore, it is THE place to go if you want to know what authentic halwa puri truly tastes like. There is the regular halwa and puri on the menu. Piping hot and crispy puris straight from the fryer wrapped around the softest halwa that will be a delight for your taste buds. Other than that, a special halwa is served which is the owner’s own creation so you won’t find it at any other restaurant. This special halwa is largely made with khoya and milk, topped with crunchy badaam, giri, kaaju, and other nuts. Every bite will melt in your mouth, with the crunch of the nuts complimenting the overall texture nicely. The chanay gravy that is served with the halwa puri is also finger-licking fantastic! It is not like the typical gravy served at every other restaurant. It is a very light curry with a great blend of spices topped with sliced onions. Apart from halwa puri, you can get a beef tikka, chicken tikka, and a plain katlama. Yes you read it right. You can order from Taj Mahal Sweets. And yes, we are aware of its location but that’s the cool part. Kyun ke jab ho paas Cheetay, tou tension nahin letay. Leave everything to us. Just visit Cheetay’s website or download the Cheetay app and tell us, kya chahiye?